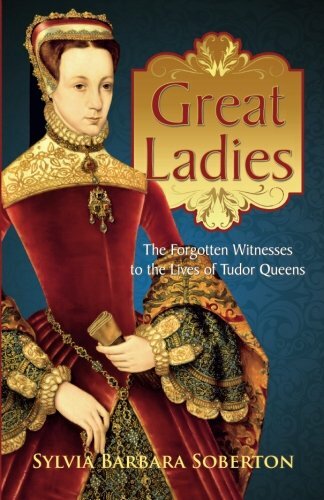 The most recent book I’ve had the pleasure of receiving, reading and reviewing is my second book and ‘best seller’ by author Sylvia Barbara Soberton called, “Great Ladies” – The Forgotten Tudor Witnesses to the Lives of Tudor Queen. The first, if you recall, was “The Forgotten Tudor Women“. There has been a great deal written about Tudor queens, but less so about those women who surrounded the throne, who may have held even more power and influence than those who actually wore the golden crown. Some ladies who served at the Tudor court are only faceless silhouettes lost to the sands of time, but there are those who dedicated their lives to please their royal mistresses and left documentation, allowing us to piece their life stories together and link them to the stories of Tudor queens. These female attendants saw their queens and princesses up close and often used their intimate bonds to their own benefit. Some were beloved, others hated. If you are new, or newer, to the Tudor era than this book is definitely for you. It’s a quick read at only 259 pages (double-spaced) and covers a lot of the information that an avid Tudor researcher like myself is already familiar with. While reading, I found myself getting bored with the story lines I was already familiar with, however, the interesting parts of the book were that of the forgotten witnesses – which, of course, is what the book is essentially about and I was not disappointed. There were several ladies listed that I had not known much about and those stories pulled me in and left me wanting to do even more research on them for future in-depth articles. Then there are the ladies like Maria de Salinas, Jane Boleyn, Anne Stanhope, Jane Grey, Kat Ashley, Lettice Knollys, Catherine Carey and Blanche Parry whom I always love to read about and was not disappointed by the information provided by Soberton. This book is well researched and sourced with a comprehensive list of notes at the end of each chapter. At the end of the book there are pages of primary and secondary sources, PhD Dissertations and websites. I’ll go back to these lists eventually and look further into the primary sources to ensure I haven’t missed anything about this wonderful period in history. The part that got me was the section about Jane Grey’s execution. While on the scaffold, blindfolded and awaiting her impending death, she was unable to locate the wooden block she was to rest her head on. Panicked she said, “What shall I do? Where is it?” A bystander, affected by Jane’s panic, guided her gently to the block where she then rested her head and stretched out her arms before her neck was severed with a blow from the axe. I would highly recommend this book to someone who is new to the Tudor era and someone who loves to learn about the great ladies that surrounded and sometimes pushed their queen off the throne to make way for themselves. ← Mary and Reginald: What could have been? This sounds interesting! I am excited to read it. Have you seen the movie, Lady Jane? They have that part on the scaffolding in the movie–however, the movie portrays Dr. Feckenham helping Jane. Anyway, love knowing that it is partly true! I have not seen that movie – I’ll have to see if I can find it online. Nice to hear from you – it’s been awhile. Do YOU have any books you’d like to share with me to review for you? The movie has Helena Bonham Carter and Carey Elwes in it…when they were super young…wonder if it may have been their first movie ever? I watched it on VHS. 🙂 Hope it’s out there on DVD somewhere. One of my favorites.